.The FCT (SON) Admission Form is On Sale for the 2018/2019 academic session. Homefct school of nursing.The FCT (SON) Admission Form is On Sale for the 2018/2019 academic session. The Federal Capital Territory (FCT) School Of Nursing Admission Form is On Sale for the 2018/2019 academic session. All interested members of the public are hereby informed. This is to inform the general public that applications are invited from suitably qualified candidates for admission into the FCT Schools of Nursing/Midwifery Gwagwalada, Abuja, BASIC NURSING PROGRAMME for the 2018/2019 academic session. The basic general nursing training is a general nursing course open to young males and females of not less than 17years of age, at the time of admission. Eligible candidates should possess WAEC, GCE or NECO with at least FIVE CREDIT passes including English Language, Mathematics, Physics, Chemistry and Biology at not more than two sittings. The result(s) presented should not be more than 10 years since the examination was written. NABTEB certificate is not acceptable. Candidate must be up to 17 years of age. 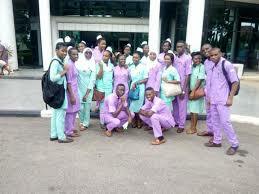 How to Apply for FCT School of Nursing Admission Form.